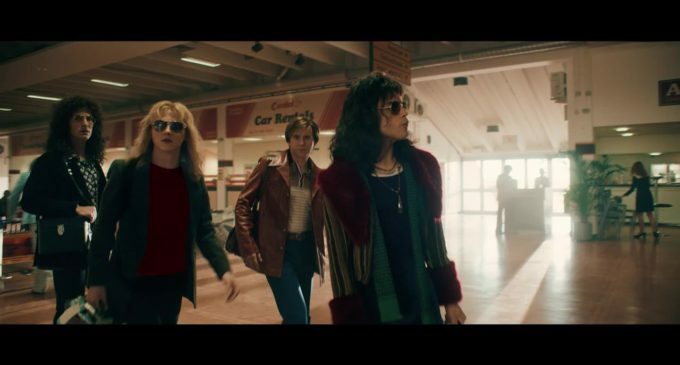 As a massive fan of the band Queen, I have been looking forward to a biopic of the band for a very long time. All members of the band are still legends in the rock world to this day, and the story of Freddie Mercury and the iconic band has been due for a proper big screen treatment for way too long. Does “Bohemian Rhapsody” live up to the massive legacy left by Mercury and his bandmates? For the most part, yes, it does. However, like many biopics of the same degree, the storytelling aspect of these films seem to be very similar execution. Unfortunately, “Bohemian Rhapsody” also falls under this same category. It is very cookie-cutter, but some of it is arguably necessary because Queen was a band that faced several of the same things that befall many popular bands. Being a massive fan of the band, though, I know some important things in their history were left out, and some of the events in the film did not exactly reflect the way things happened in real life. For example, Mercury’s AIDS diagnosis timeline is a little off in the film, and there are a few songs and performances I would have liked to see be included in the film. These do not completely deter the overall quality of the film, but for a film about the band and its members, it’s only appropriate these things be included. What does deter the quality of the film, however, is the treatment of Mercury’s sexuality. It does not negate his homosexuality in any way, but it almost entirely erases his sexual fluidity. This is disappointing because it was such an important part of Mercury’s life, and having the film about him almost ignore this is an immense disservice to his incredible legacy. But, I had a rollicking good time with “Bohemian Rhapsody.” I was invested throughout the entire runtime of the film, loving almost every second of seeing one of my favorite bands brought to life on the big screen. It may have been a bit formulaic in its execution, but it is easily some of the most fun I have had watching a movie in a theater all year — I was consistently entertained. Lead star Rami Malek embodies all of the flamboyancy, charm and immense talent that is Mercury and delivers one of the greatest performances this year. He is a stunning revelation. The film focuses more on Mercury than any of the other bandmates, and while I would have liked to see more character development from them, the actors that do portray them are all fantastic, too. But Malek is the real shining star of the whole film, stealing every single scene he is in, utterly commanding the screen and demanding us to witness his greatness. If he does not get an Oscar nomination, nothing is right in this world, and I demand we all rise up and storm the Academy. The final 25 minutes, however, are absolutely incredible to watch. It is the band’s entire set at the 1985 Live Aid performance recreated — and boy is it electrifying. The contagious energy will make you fall in love with the band all over again, and it is easily one of the best sequences in any film I have seen so far this year — and I have seen a lot of them. “Bohemian Rhapsody” is like a greatest hits album: It hits all the right notes in terms of getting to know who the members are and what made them as famous without delving any deeper than necessary. It is certainly not without its issues, but it is quite the crowd pleaser, and Malek is absolutely immense in his role. All hail her majesty, indeed.